Last year the Bank of England introduced the new polymer £5 bank note. 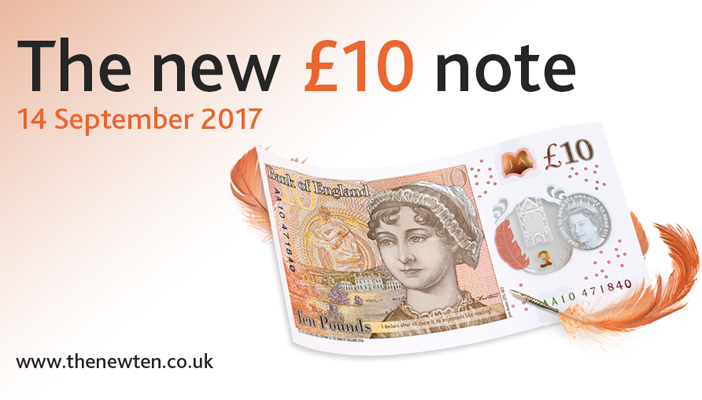 This year it’s the new £10 note which incorporates features to help blind and partially sighted people better navigate their notes. As with the £5 note the new £10 note will retain tiered sizing and include bold numerals and a similar colour palette to the current paper £10 note, but with a series of raised dots the new tactile feature will help distinguish one note from another. Here at RNIB we’re delighted to be continuing our work with the Bank of England on the accessibility bank notes. Throughout this process we have worked with a number of blind and partially sighted people to understand what’s needed to create accessibility, the feedback we’ve collected has enabled us to advise the Bank of England on the size of the notes, what they should feel like, and how they would work best for people with sight loss. "RNIB continues to work with the Bank of England to offer guidance on how the new bank notes should look and feel. The new £10 note will be made from the new safer, cleaner polymer material and will be a similar colour to the current note. The new tactile feature on the £10 note will help distinguish between the current polymer £5 note, and future notes. These characteristics should help blind and partially sighted people distinguish between denominations. The staged introduction of the new notes will provide blind and partially sighted people with time to get used to the new materials being used." The rigorous user testing process used in the development of the notes has continued, with feedback steering the work carried out by the Bank of England. Handling cash can often be a challenge if you're blind or partially sighted, because it can be difficult to tell the difference between the different notes and coins. We hope the creation of these notes will help lots of our members exchange money easily and in a safer manner. Not only that, hopefully it will encourage other businesses and associations to follow suit, as they recognise the growing importance of making their products and services accessible to all. RNIB Business is dedicated to developing and delivering accessibility solutions for business, including training, consultancy, assistance for development projects and technology support.